Soon after launching the Bolt Supreme and Bolt Supreme 2, Micromax has launched its latest Bolt-series smartphone, the Bolt Selfie. The company has listed the handset on the company site and has confirmed that it will be a Flipkart exclusive. Priced at Rs. 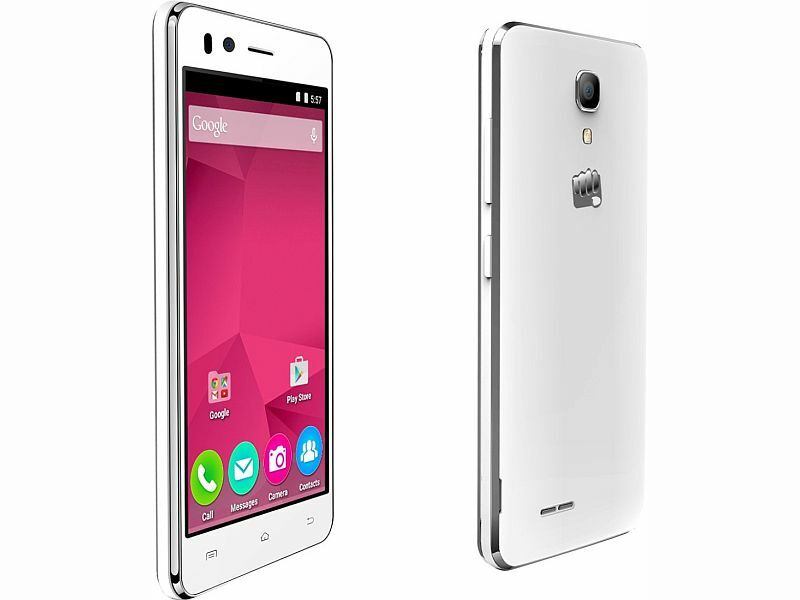 4,999, the Micromax Bolt Selfie is now available to buy via the online retailer in White and Champagne colours. The biggest highlight of the Micromax Bolt Selfie smartphone is its 5-megapixel front fixed-focus camera. The handset also sports a 5-megapixel rear camera with LED flash. Apart from the camera, the Bolt Selfie supports 4G LTE. The dual-SIM Bolt Selfie features a 4.5-inch FWVGA (480×854 pixels) IPS display and is powered by a 1GHz quad-core MediaTek (MT6735) processor paired with 1GB of RAM and 8GB of inbuilt storage. The handset supports expandable storage up to 32GB via microSD card. The Android 5.1 Lollipop-based Micromax Bolt Selfie supports dual Micro-SIMs. The handset is backed by a 1750mAh removable battery that can offer up to 18 hours of talk time and up to 260 hours of standby time. Apart from 4G, the Micromax Bolt Selfie supports GPRS/ EDGE, 3G, Wi-Fi, Bluetooth, Micro-USB, and GPS. Last week, Micromax launched two entry-level 3G-enabled Android smartphones in the country, theBolt Supreme, and the Bolt Supreme 2. The former was priced at Rs. 2,749, while the latter was priced at Rs. 2,999. The Indian handset maker earlier this month had also unveiled its new Canvas Evok smartphone range. Under the new Evok-series, Micromax introduced the first smartphone Canvas Evok priced at Rs. 8,499. The new smartphone went on sale exclusively via Flipkart.